This week we have 18 new Spider-Man comic book appearances, and 12 of those are variant covers. 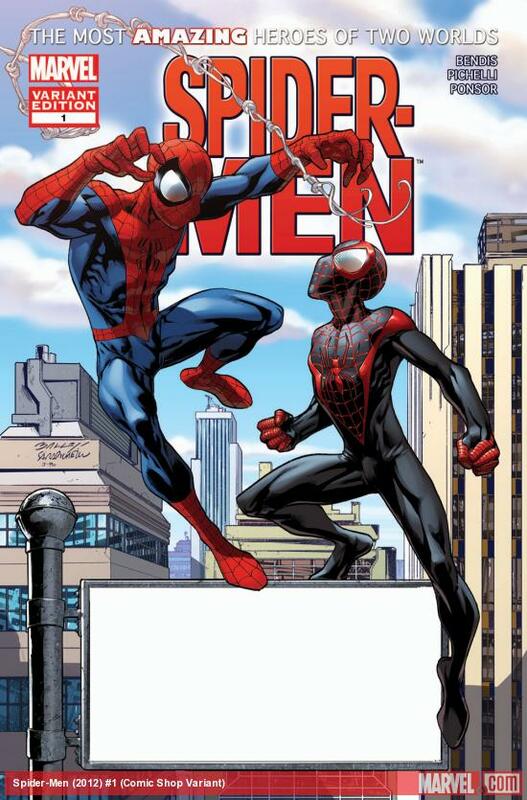 The highly promoted first meeting of the 616 Marvel Universe Spidey (Peter Parker) and the Ultimate Universe Spidey (Miles Morales) occurred in Spider-Men #1. In addition to its regular cover and 2 variants, there is a 3rd variant cover that was made available to retailers who wanted to purchase 500 copies to get a personalized cover. This time around 24 comic shops took Marvel up on the offer. Most are in the US, but a couple are in Canada and one in both England and Italy. This week I will be embarking on a pilgrimage to the largest comic book dealer in the US (and on the Web), Mile High Comics, in Denver, Colorado. The weekend also marks the inaugural Denver Comic Con and I am excited. I'll report more about the show and shop.